Engine: Harland & Wolff B & W six cylinder 6K7 4 EF oil engine, 11,600 bhp 15 knots. Cargo Handling: Fitted with four electric hydraulic deck cranes of 18 tons SWL suitable for grab handling. 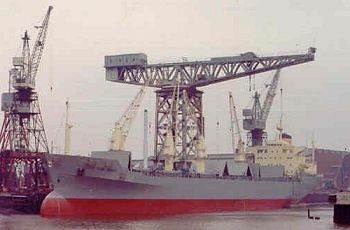 1976: March,completed by Govan Shipbuilders Ltd., Glasgow (Yard No. 216) for Lyle Shipping Co. Ltd.,Glasgow. Scottish Ship Management Ltd.,Glasgow, managers. 1985: Sold Commodity Handling Pte. Ltd., Singapore flag. Renamed RODNEY. 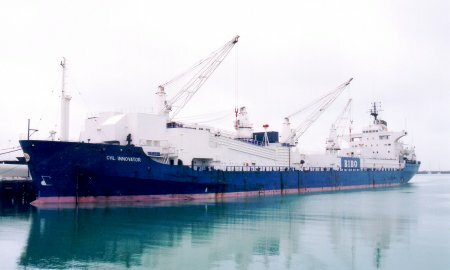 1986: Converted to a processing bulk carrier. Timur Carriers (Pte) Singapore, managers. Renamed CHL INNOVATOR. (See below photo). 1991: Management to TNT Shipping International, Rotterdam. 1994: Management to Holyman (Europe) B.V.
1999: Management to CHL Shipping B.V.
2000: Management to Kristian Gerhard Jebsen Skipsredri A/S. 2010: 21st December. Management to Gearbulk Ltd.
2019: Still in service. Arrived Izmir Anchorage 18th April.